A recently completed 1.4 megawatt solar PV system in Hawaii-which features cutting edge technology and takes on the challenges of the intermittent nature of renewable energy-just may be the template for a national system in the U.S. The 1.4 MW PV solar power installation sits on a 10-acre site on the Palawai Basin on the island of Lana'i and can generate over 30 percent of the island's peak electrical power. Since Hawaii is known for being a sunny vacation destination, it's no surprise that the island of Lana'i would choose to harvest solar energy. The small island off the coast of Maui recently constructed Hawaii's largest solar photovoltaic (PV) farm and micro-grid. The 1.4 megawatt (MW) installation sits on a 10-acre site on the Palawai Basin and can generate over 30 percent of the island's peak electrical power and over 10 percent of its total electrical energy. What makes this solar farm so special is the cutting-edge technology. It's the first solar PV farm to be controlled remotely by a utility, Maui Electric Company, Ltd. (MECO). And the advanced integration system may be a possible template for how to handle large amounts of solar energy hitting the grid. The island community wasn't looking to be an innovative leader. They came to solar power out of a serious economic need. Formerly an agricultural community, with power traditionally generated solely through diesel generators, the island's current economy is entirely based on tourism. When the cost of diesel fuel skyrocketed a few years ago, the price of fuel outpaced the profits generated from tourism, motivating them to find a more independent source of energy. It took a number of companies pulling together to create a state-of-the-art solar farm: Lana'i Sustainability Research LLC-a Castle & Cooke subsidiary focused on solar management, providing micro grid development, financing, and operation; California-based SunPower handling the design and construction, and providing a solar tracking system; and Satcon Technology Corporation, adding its micro grid power conversion solution, Satcon Spectrum, in conjunction with partner SunPower. The farm began producing power in December 2008 and "is the first example of that percentage (34%) penetration into a grid," says Michael Levi, Satcon's senior director of worldwide marketing. "It's an island grid, so it's a smaller scale. But it's a perfect template for what's to come with the interjection of solar onto the national larger grids in the U.S.-and what's already being done successfully in Europe." The average person might not think it's difficult to add renewable energy to the grid, but MECO knew it would be a challenge from the start. First, they would need to manage the grid remotely from Maui. Second, and more importantly, they needed to be able to manage intermittency issues-supplying power between day and night as well as around the cloud cover found in tropical climates. Renewables tend to have time-varying outputs that can change rapidly, and these can destabilize existing grids with older, slower generating technology. "The plan was to basically balance the load-using solar production as much as possible and then the spinning diesel reserves when that isn't possible," explains Levi. "To achieve this, and keep a stable grid, required a combination of art and science." The "art" Levi says comes in forecasting. "Clouds don't just appear. They're forecastable within a 12 to 24-hour window. So the real question became, how do you switch between the solar power plant and the spinning reserve power plant? While forecasting can give an estimate of the average output of the renewable plant, the instantaneous value is a direct function of the ambient and weather conditions, specifically cloud cover for a PV farm." Technology being developed at Satcon, combined with the island's specific needs, gave birth to what Levi refers to as a "whole new suite of functionality." "To date, the solar industry has focused on power production-from the panel to the inverter," says Levi. 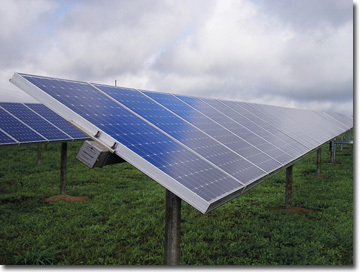 "What hasn't necessarily been addressed yet, simply because the industry has been maturing, are the tools that enable controllability of the solar power plant asset from its interconnection point, the inverter to the grid. With Lana'i, we've built control capabilities that we installed into the system. More specifically, remote control capabilities." Integration System (SEGIS) grants, which Satcon has received the last two years from the Department of Energy (DOE) and administered by the Sandia National Laboratories. "For the past two years, our focus has been working with them to develop utility control features in large scale solar converters, and Lana'i is ultimately the manifestation of some of what has come out of that program," says Levi. What makes the Lana'i system truly unique are the inverters. "They are really the only digital device on the system," Levi explains. "Panels are passive. The efficiencies that you develop in the panels are specific to the processing technology of the circuit. There is no 'intelligence' in that. The inverter, however, is a digital device. It is advanced power electronics." 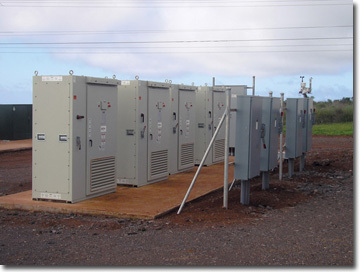 Satcon, which provided its micro grid power conversion solution to the Lana'i project, discovered that by utilizing the "intelligence" of the inverter, it becomes the brain/control center of the system. And the Maui Electric Company has been able to utilize that intelligence. Satcon discovered that by utilizing the "intelligence" of the inverter, it becomes the brain/control center of the system. And Levi says it is intelligence that Lana'i has been able to utilize. "The utility on the island of Maui can view the asset and manage the asset just like they manage every other power plant on their grid network." With the new technology, MECO can easily switch between solar and diesel on the network and remotely control the reactive power from the PV plant. "That reactive power allows you to inject stabilizing energy into the grid, so that when disruptions occur, or when there are any sorts of testing moments on the grid, you can use the inverter to generate reactive power and smooth out those disruptive forces," Levi says. Satcon sees the technology having huge benefits when it's scaled up nationally. For example, the company has done models of the 2003 blackout that began in Ohio and spread throughout the eastern seaboard. "If inverters were on that grid and used as we know they can be, it would have required a less than five percent penetration of inverters, such as PV inverters, to stabilize that disturbance-the large disruption that spread from Ohio-and keep it from causing the blackout." "Lana'i is the example of how to control the asset and how to give the utilities control over the asset into their overall network," says Levi. "But it's also about improving the grid itself and our vision of how we fit into this notion of the Smart Grid." Talk to 10 different people, and you'll get 10 different definitions of what the Smart Grid consists of. For Satcon, the smart grid has to do with the actual transmission and distribution of the electrical energy. "Our view is that a smart grid is a faster grid," says Levi. "The current grid infrastructure is electro-mechanical-not digitized. So the fastest reaction time that a utility has is tenths of a second. But with an inverter, you can isolate, react, and dampen in hundredths of a second, if not faster. And that is the difference between allowing a catastrophic event to propagate, like the blackout, versus controlling it, isolating it, and eliminating it from growing." Levi adds, "As I view it, Lana'i is the first template. Because it's an isolated island grid, we can see what the next generation national grid will look like." Getting to the smarter, faster grid will require innovative utilities and those highly motivated to change, as in Lana'i. Looking back, Levi sees the Lana'i achievement as just a successful balance of art and science. "On the art side, it was developing the process, because the approach was completely different. Most utilities flinch when they hear the word intermittency, because they believe it brings instability. So the key to this approach was the 'switch' between that dynamic plant asset and the spinning reserves." The "science" was the technology that made the switch possible. Levi sums it up as "simply innovation-and in this instance, the science and the art came together perfectly." Leo Casey, Chief Technology Officer of Satcon, agrees. "What we achieved with MECO, Castle & Cooke, and SunPower is a significant advancement in solving renewable energy challenges of intermittency and energy storage and will help ensure uninterrupted, utility-grade renewable energy to deliver the clean generation, energy security, reliability, safety, sustainability, and cost effectiveness required for the island." If the system proves to be as successful as people expect, it may well be one of the templates of our renewable future.